When I was a child the family next door had several daughters about half my age. The youngest was named Tutu. She was a sweet and very shy little three-year-old at the time of the event I’m about to describe. Our neighborhood was post-World-War-II VA bargain suburbia. Small, modest one-story homes set very close together on very small rectangles of property, with diminutive front and backyards. It was a proverbial tract of houses, expressed in five architectural plans. Tutu’s family lived in one that featured a garage in front of the house with the door perpendicular to the street and accessed via a short, squat quarter-circle driveway. Consequently, most of the area in front of the house was smooth concrete. An ideal place for Tutu’s family and mine to ignite our combined purchase of Red Devil fireworks. On the particular 4th of July that I am recalling, it occurred to Tutu’s father that she might begin to overcome her fear of fireworks if he helped her light Piccolo Pete – a fountain-style pyrotechnic device that sent a funnel of colorful sparks several feet into the air while emitting a shrill whistle. It consisted of a flat, square wooden base of about an inch and a half on each side and about an eighth of an inch thick, upon which a cardboard tube stood that was, as I recall, about five inches tall and half an inch in diameter. A short, thick fuse projected from the top of the tube. Tutu’s father gave his daughter a sparkler, which he lit. That was excitement enough for her and she would have let it fall from her hand if her father had not placed his hand around hers and guided the shimmering end of the sparkler toward Pete’s fuse…all the while assuring Tutu that all would be well. The fuse began to hiss, and in her haste to withdraw the quivering sparkler Tutu knocked Pete on his side. For an instant it seemed that her father considered whether he could set Pete upright again, but there was no time. Suddenly great sprays of orange embers where spurting out onto the concrete to the accompaniment of a growing screech like a buzz bomb coming down on London. And Pete began to move, impelled fast and menacing by the flaming jet he expelled. Tutu ran screaming toward the house, but in a swift arch Pete intercepted her. Horrified she scurried backward toward the street, but Pete got there before her and drove the panicked child onto the lawn where he bounce and leapt in zig zag pursuit. However she tried to escape, Pete anticipate her anguished flight which he thwarted with seeming willful and malevolent intent. All the while Tutu’s father chased the little girl, who he no doubt would have taken up into the safety of his arms if he could have caught her. Suddenly Pete fell still and silent, and Tutu was carried sobbing into the house. What could she have done, I wondered, to have merited such torment? Of all those present, why had an apparently willful punishment fallen upon the one among us already most fearful of the world? The distressing display was brief, but long enough to feel sadistic, like something powerful intentionally tormenting the defenseless. 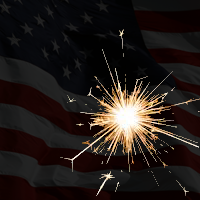 This entry was posted in Reflections and tagged America, Care, Childhood, Sparkler by thrum. Bookmark the permalink.